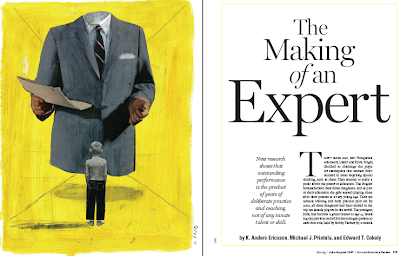 The Making of an Expert - HBR.org, from the July–August 2007 issue of HBR, by by K. Anders Ericsson, Michael J. Prietula, and Edward T. Cokely is an excellent article that deserves to be read, re-read, and passed on to as many people as you can. "New research shows that outstanding performance is the product of years of deliberate practice and coaching, not of any innate talent or skill." But what this article does is to tell us that hard work is not enough by itself. And that how much hard work do you need? Why does practice by itself not produce the desired results? If you need help, what kind of help do you need? "Current research has revealed many other fields where there is no scientific evidence that supposed expertise leads to superior performance." Huh? Yes, you read that right. Wine tasting is one such example. If you were among those that believed that this self-concocted myth about skills involved in wine tasting is nothing more than the creation of a bunch of self-styled fatuous experts, it should not come as a surprise that in a wine tasting competition organized in 1976, "the experts often mistook the American wines for French wines and vice versa." What does true expertise really mean? How do you go about becoming an expert? "Real expertise must pass three tests. First, it must lead to performance that is consistently superior to that of the expert’s peers. Second, real expertise produces concrete results. Brain surgeons, for example, not only must be skillful with their scalpels but also must have successful outcomes with their patients. A chess player must be able to win matches in tournaments. Finally, true expertise can be replicated and measured in the lab." I think that the first two points are pretty much one and the same. Superior performance and concrete results are more or less the same, wouldn't you agree? A brain surgeon, if he is skilled with his scalpel, and produces successful outcomes with his patients, would be thought of as having performance superior to his peers, especially if he does so that is more consistent than his peers. "You need a particular kind of practice – deliberate practice – to develop expertise. When most people practice, they focus on the things they already know how to do. Deliberate practice is different. It entails considerable, specific, and sustained efforts to do something you can’t do well – or even at all. Research across domains shows that it is only by working at what you can’t do that you turn into the expert you want to become. This kind of deliberate practice can be adapted to developing business and leadership expertise." This - deliberate practice - for me is they key to becoming an expert. My favorite example is from the Mahabharat, the great Indian epic. The great guru, Drona, took the Pandavas under his wing, and started training them to become skilled warriors. Arjuna, the third of the Pandavas, was a skilled archer, and Drona wanted to make him the greatest archer ever. One night, as Arjuna was eating his dinner, a wind blew out the candle and Arjuna's hut was plunged in darkness. But, he did not stop eating. By force of habit, his hand was able to find its way to his mouth, even in complete darkness. This is also pretty much true for most of us - we can, usually, rely on our hand to find its way to the mouth, darkness or not. Coordination of muscles here is something that is almost so effortless as to be considered reflexive. It was then that Arjuna realized that if he could train himself to eat in complete darkness, even without realizing it, he could train himself to become the world's best archer. But how much practice, for how long??? "By now it will be clear that it takes time to become an expert. Our research shows that even the most gifted performers need a minimum of ten years (or 10,000 hours) of intense training before they win international competitions." Yikes! Yes - you read that right. 10,000 hours. Let's break that up. Say, if you practice something, with diligence, dedication, and focus, four hours a day, five days a week, it works out to 4 x 5 = 20 hours a week. Do it for 50 weeks a year, allowing for breaks. That gets you to 1,000 hours. Do this for 10 years, and you have 10,000 hours. 10,000 hours, or ten years - whichever way you look at it, the cost is there for you to see. But, look at the flip side too. If you can find it in yourself to work at something you choose for so long, with the dedication required, and with the honesty it calls for, it is pretty much an unmatched barrier to entry (to use a strategy phrase). The number of people who can then compete with you at that level could be measured in tens or hundreds, out of hundreds of thousands or even millions who are in that same profession. And as we all know, economics students or not, price is a function, linear or not, of supply. And the supply of super-skilled professionals is extremely limited. The prices for their expertise is, by corollary, high. Think of the price an expert brain surgeon or very successful lawyer can command. Arnold Schwarzenegger, champion bodybuilder, never had calf muscles that were as toned, as developed, and as awe inspiring as his biceps. This is a relative assessment, mind you. His calves had more musculature and more definition than most people in the world, but when compared with the competition, they were only average. He set out to work on them, and a year later, he had calves that could stand up to the best in the business. When asked about how to build such muscles, his response was, "500 hours". That's the time it took him to work, regularly, with dedication, to turn his calves into trophy winning pieces of musculature. Practice can make you a skilled archer. It can even make you charismatic. Yes. Genuine experts not only practice deliberately but also think deliberately. It’s very easy to neglect deliberate practice. So charisma can be learned through deliberate practice. Deliberate practice involves two kinds of learning: improving the skills you already have and extending the reach and range of your skills. The enormous concentration required to undertake these twin tasks limits the amount of time you can spend doing them. Deliberate practice was a key to his success. “Practice puts brains in your muscles,” he (Snead) said. If we analyze the development of the well-known artists, we see that in almost every case the success of their entire career was dependent on the quality of their practicing. In practically every case, the practicing was constantly supervised either by the teacher or an assistant to the teacher.” Research on world-class performers has confirmed Galamian’s observation. It also has shown that future experts need different kinds of teachers at different stages of their development. What this says is that apart from dedicated and targeted practice you also need a guru. Take the case of Arjuna again. When Arjuna realized the importance of practice, Drona stepped forward, and told Arjuna that he was going to make him the world's best archer. So Arjuna, at a point in his life when he needed it most, got the best guru that an aspiring archer could have asked for. The role of a guru is so vital and important in the context of Indian culture, that the example of Eklavya has become legend too. He became as good an archer as Arjuna, or perhaps a better one, by practicing in front of an idol of Drona. Why Drona refused to take Eklavya as his disciple in the first place, and what happened with Eklavya and the guru-dakshina he had to give, is another story, with different lessons. Your ability to attain expert performance is clearly constrained if you have fewer opportunities to engage in deliberate practice, and this is far from a trivial constraint. The best coaches also identify aspects of your performance that will need to be improved at your next level of skill." Before practice, opportunity, and luck can combine to create expertise, the would-be expert needs to demythologize the achievement of top-level performance, because the notion that genius is born, not made, is deeply ingrained. Expertise is not captured by knowledge management systems. Knowledge management systems rarely, if ever, deal with what psychologists call knowledge. They are repositories of images, documents, and routines: external data that people can view and interpret as they try to solve a problem or make a decision. There are no shortcuts to gaining true expertise. True. Very true. Where KM systems do help is by providing in a single place materials that are relevant to the pursuit of gaining expertise. They make available a whole range of documents, images, papers, discussions, and more that a person could peruse and over time acquire expertise. This assumes of course the preconditions the authors outline in their paper: dedicated practice, and mentoring. Books such as Talent Is Overrated: What Really Separates World-Class Performers from Everybody Else , Outliers: The Story of Success , and The Myth of Multitasking: How "Doing It All" Gets Nothing Done supposedly cover the same topic. I have yet to read any of these books, but will blog about them once I have, if I have. The one book that the article cites is The Cambridge Handbook of Expertise and Expert Performance , which is a compilation of studies "based on rigorous research that looked at exceptional performance using scientific methods that are verifiable and reproducible. ... The 900-page-plus handbook includes contributions from more than 100 leading scientists who have studied expertise and top performance in a wide variety of domains: surgery, acting, chess, writing,computer programming, ballet, music, aviation, firefighting, and many others."